Seattle Police released dashcam video and audio of the fatal shooting of Charleena Lyles in Magnuson Park. Officers can be heard shouting “Get back! Get back!” before gunfire breaks out. Also, details from a June 5 call to her home bear striking similarity to Sunday’s incident. 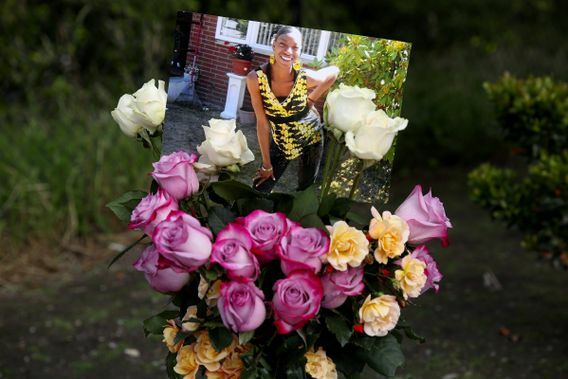 Two weeks ago, Seattle police responded to a domestic-violence call at the home of 30-year-old Charleena Lyles. During the encounter, police say Lyles armed herself with a pair of shears and threatened officers. Although the officers reported that they feared for their safety, they were able to talk a distraught Lyles into dropping the shears. The June 5 call is strikingly similar to Sunday’s incident at Lyles’ Magnuson Park apartment, which ended with the mother of four being shot to death by two officers. Police say Lyles was armed with two knives, according to a newly released transcript of audio of the shooting. Family members are angry that officers used deadly force when police concede that the two responding officers had “less lethal-force options” at their disposal, although the department has confirmed that neither was carrying a Taser. Lyles had been struggling with mental-health issues for the past year and was concerned that authorities would take her children, one of whom they said has Down syndrome, her family said. Both of the officers involved had undergone Crisis Intervention Training (CIT) and one was a certified CIT officer, meaning he had undergone additional intensive de-escalation and mental-health intervention training, Police Chief Kathleen O’Toole said Monday. Lyles’ family said Sunday that the shooting could have been avoided and that they believe race — she was African American — was a factor. The officers who shot Lyles are white, police said. O’Toole said Monday neither officer was armed with a Taser. SPD officers are given the option of carrying a Taser, pepper spray or a baton as a less-then-lethal option. The names of the police officers who shot Lyles have not been released. “People should not fear getting shot when they call law enforcement for help,” Johnson said in a statement. Outrage over the shooting was swift and widespread, with marchers in New York City staging a loud protest and social media bristling with angry posts hashtagged with #SayHerName and #CharleenaLyles. Candidates for Seattle mayor also weighed in on the shooting, with several calling for police accountability. There are several more commands to “get back” before they opened fire on Lyles as at least one child could be heard crying in the background. Later in the day, the department released additional dashcam video and surveillance video from the hallway of the apartment, which briefly shows one of the officers scrambling outside the apartment doorway, with his hands extended in front of him. The transcript of the audio recording was also released. The audio, which was redacted in several places, includes the two unidentified officers speaking about Lyles’ mental health and the June 5 incident before they spoke with her Sunday. The officers were responding to Lyles’ call Sunday morning reporting an attempted burglary at her fourth-floor apartment. At some point, police said, she displayed two knives and two officers shot and killed her. “Hello, good morning,” one of the officers says in the audio. “You call the police?” The officers continue to speak with Lyles and ask her about a reportedly stolen Xbox. “Hey! Get back! Get back!” an officer shouts before an eruption of gunfire. Police said several children were in the apartment at the time of the shooting and were not injured. The children were identified by family as two boys and a girl, ages 11, 4 and 1. Police took the three children from the home. A fourth child was not home at the time, according to a relative. Police said Monday that typically one officer is dispatched when property crime is reported, but in this case two officers were sent because of the previous incident involving Lyles. Before the shooting, the officers can be heard discussing previous calls to Lyles’ apartment, including the June 5 domestic-violence incident. The audio is linked to the dashcam of the patrol cars of both responding officers, police said. “She let them in, then she started talking all crazy about how the officers weren’t gonna leave,” one of the officers says, referencing a previous call. “Wait, is this the one with like the three kids?” one officer says on the audio before the shooting. The clip seems to jump abruptly at that point, and the officers can be heard walking. Shortly after, they begin speaking with Lyles. While one officer searched the area for a suspect who had reportedly fled, two other officers requested immediate help at the apartment, according to a police report. “The complainant for the initial call, Charleena Lyles, had armed herself with a pair of extra long metal shears and was threatening the officers,” the report says. The officer who had been searching for a suspect wrote that he went into a small apartment and saw Lyles on the couch in the living room with a small child seated beside her, according to the report. The other two officers — one using a different couch as a barrier and the other in the nearby kitchen — had their pistols drawn in a low ready position within 8 to 10 feet of Lyles. The officer in the kitchen was giving clear commands to drop the scissors, the report says. Those two officers felt fearful for their safety, the report says. More officers arrived, including two sergeants, and the third officer tried to talk Lyles into dropping the scissors, according to the report. The officer by the couch would have been unable to leave without getting dangerously close to Lyles, the report says. Lyles was making comments about wanting to “morph into a wolf” and “cloning her daughter,” the report says, along with comments about how police officers were devils and members of the Ku Klux Klan. Her daughter, 4, moved to Lyles’ lap and crawled around her waist, the report says. After repeated requests to drop the scissors, Lyles dropped them to the floor, according to the report. Lyles initially refused to step away from the scissors, but then she did and calmed down, the report says. Monika Williams, Lyles’ sister, was summoned to the apartment to take custody of the child, and Lyles was taken into custody by police. “After talking with Lyles’ family, we learned that Lyles has experienced a recent sudden and rapid decline in her mental health,” the report says. But the family expressed surprise when told of her behavior and statements during the incident and said she had not engaged in similar conduct in the past, according to the report. The family said it was concerned and wanted Lyles to “stabilize her mental health before it gets worse,” says the report, which urged the case be forwarded to mental-health court. Lyles was charged with harassment and obstructing a public officer in Seattle Municipal Court. She pleaded not guilty and appeared in Mental Health Court on June 13, where she was ordered to be released the next day with conditions, court records show. She was ordered to possess no weapons and check in with the court’s Day Reporting Program every Tuesday and Thursday and submit to random drug and alcohol testing. Her next court appearance was set for June 27. The Seattle Police Department has been under a federal consent decree since 2012 after a Department of Justice investigation found its officers routinely engaged in excessive use of force, most often against people with mental or substance-abuse problems. Federal investigators also found evidence of biased policing. Tracking contacts with people in crisis or suffering from mental-health issues is now part of the department’s crisis-intervention program. The program was approved by a federal judge in February 2014 as part of the federal oversight. A GoFundMe page has been created to help support Lyles’ children and family. Seattle Times reporter Mike Carter and news researcher Miyoko Wolf contributed to this report, which also contains information from The Times archive.